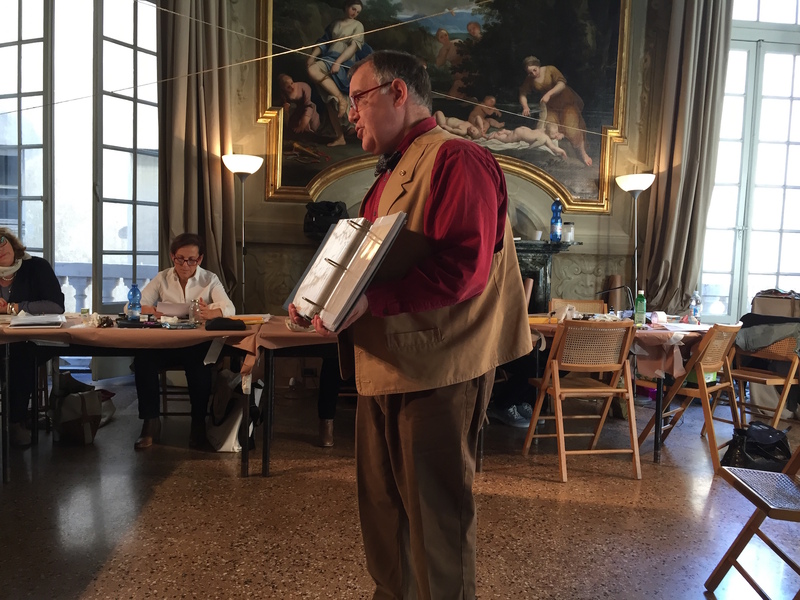 During September 2015, the city of Genova hosted an unforgettable Spencerian Workshop at Palazzo Lomellino, a Palace built in the XVII century. Michael Sull arrived directly from a landlocked state as Kansas to teach his skills in one of the most full of history Mediterranean city. All this possible under the organisation of Simona Picciotto, designer and calligrapher who lives and work in Genova. Various Spencerian workshops has been held and organised by Barbara Calzolari, one of the the most skilled calligraphy artists nowadays. She learnt this craft from Michael and she also was taking part of this events; so we had the chance to spend our three days with two extremely talented people, Michael and Barbara. Actually reaching Genova is very easy for me, so I signed up took a train without any idea about how hard and intense can be a Spencerian workshop. Michael Sull, was following constantly, from the very beginning when we were setting up our oblique penholder till the final flourished “Spencerianish” birds. Ferro Gallico, handmade penholders, smooth paper, Nikko G and a lot of passion are the ingredients you need to master Spencerian. During these day Michael and I exchange some gifts, he gave me a printing block of a Spencerian Magazine and I exchange it with a Wind Roses printed at Archivio Tipografico. “The printing block was most probably made during the second decade of the 20th century; a good guess would be approximately 1915, thus making it 100 years old. It was made by an American die-casting company from our mid-west region; probably in Chicago. The wooden base is cherry wood; the actual metal of the raised “die” is zinc. Zinc was the most common metal used for this purpose. However, if a particular lettering design was intended for extended use over a projected run of many issues of the penmanship magazine, the dies were then made of either copper or steel. 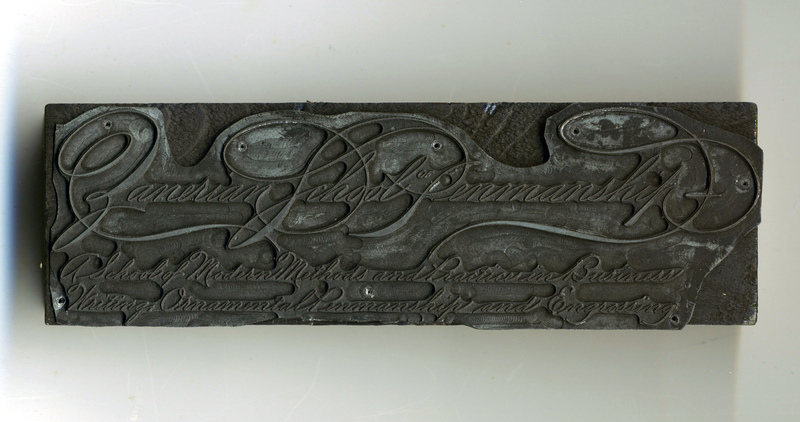 This printing block was used in the printing of the Zaner-Bloser magazine, “The Business Educator”. It was the most prominent commercial monthly penmanship magazine of the penmanship era.The die was made by an photoengraving process where the original artwork was photographed and the image, in reverse, was precisely made into the zinc die. You can easily find out the specific information on the process by looking up “photoengraving” on the internet. The lettering is American Ornamental Penmanship, which is the decorative form of Spencerian Script. The Zaner-Bloser Company was founded in Columbus, Ohio as the Zanerian Art College in 1888 by two of the most famous American Master Penmen: Charles Paxton Zaner and Elmer Ward Bloser. 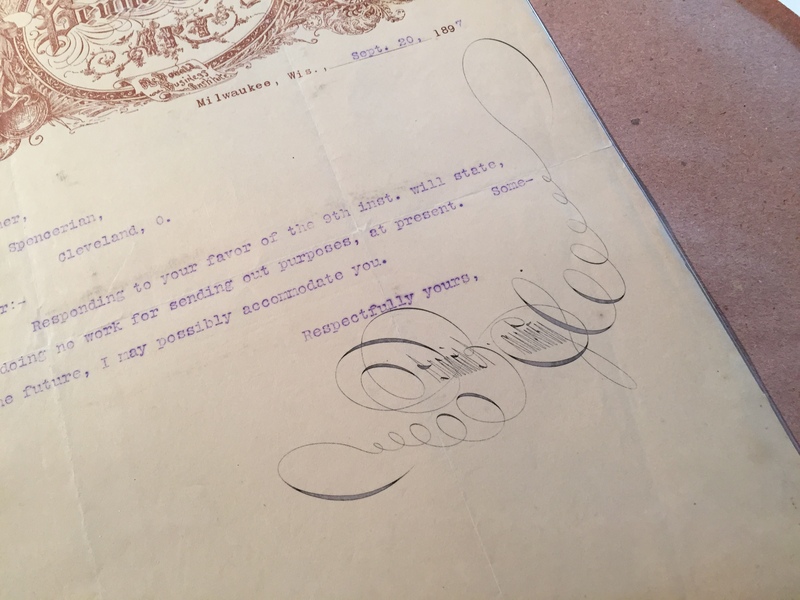 My own penmanship teacher, Paul O’Hara, graduated from that college as a Master Penman in 1908; his teachers were Zaner and Bloser. Their magazine changed its name several times, finally becoming known simply as “The Educator”, but it had a remarkable press run for 65 years, ending in 1955! Through all of those years, the Zaner-Bloser Company made thousands of those print blocks from thousands of original art specimens that they commissioned from leading penmen, educators, and lettering artists of their day. The company never threw any of the blocks away! The company still exists– it is the oldest, largest and most respected publisher of handwriting curriculums for public schools in America. 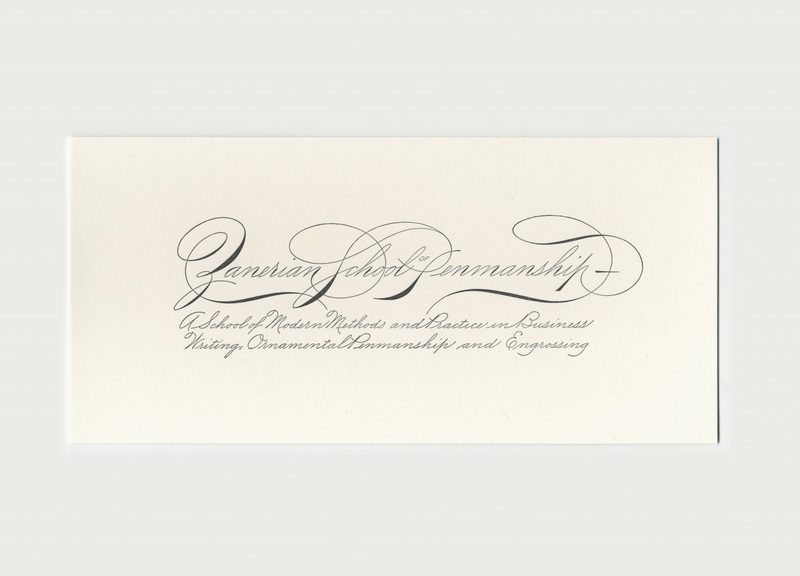 I was appointed as the company’s corporate Master Penman in 2009 when I became involved with identifying penmanship artworks from their legendary collection that the company was donating to the University of Scranton in Scranton, Pennsylvania. I am the last living, working Master Penman associated with the company. In 2010 the company made their vast collection of printing blocks available to the archival librarian from the University of Scranton and myself for our study, and I was given permission to obtain some of the blocks. That is where your block came from. Until I found it, it had lain in storage for at least 70 years”. Feeling absolutely lucky to own this gem, I got back to Torino and I contacted again Archivio Tipografico for reproducing some prints. They were very excited since the early beginning and amazed about this kind of lettering that was very new for many of us, specially on a printed block! The print block has been cleaned and restore, but it was already in very good conditions as you can see. I think the heritage of this penmanship needs to keep alive and showed not only on digital supports. I hope you enjoyed the story, let’s keep fresh our memories ! Posted in Calligraphy & Lettering and tagged calligraphy, penmanship, spencerian. ← NewerWe never read, we just look at letters.